How to Choose Right Skilled Nursing Home – If you want to know Skilled Nursing Facility homes, skilled nursing facility vs nursing home, skilled nursing facility Medicare, skilled nursing facilities for seniors. We will tell you what are these. The skilled nursing home provides the facilities to people who are not yet able to take care of themselves at home. While a nursing care center generally looks a little institutional because of the type of care provided, an assisted living usually resembles an upscale apartment community. Nursing home residents are more likely to share a room with another senior. Residents in an assisted living community usually have their own apartment or suite. Residents in a nursing home require around the clock care and monitoring. They typically live with more complex health care conditions that require the assistance of a skilled nurse or a physical or speech therapist. Some require respiratory care services. By contrast, residents in an assisted living community generally require custodial care. It might be a person who lives with memory loss and isn’t safe living alone. Or an adult with mobility problems who needs a little help transferring from their bed to their favorite chair. How to Choose Right Skilled Nursing Home? Choosing a right nursing home for Elderly care can be difficult. So, here are some of the tips mentioned below which can help you to select the right skilled nursing home for Senior Care. Staff Members – While selecting the skilled nursing home ask about the staff turnover within the home. Working in a nursing home is extremely demanding job both physically and mentally. So, the quality one nursing home will have staff members who have been there for many years and seems to be happy. Other Residents – Take a good look at all the other residents around you. Ask yourself if they seem to be happy. Observe them and their activities. Are they clean and groomed and wearing clean clothes. Also, observe the nursing home during the meal times as well as during activities. Facilities – Before finalizing one nursing home look for a facility which they provide. Look at all the things like odors, clean, food, etc and then make a final decision. License – Ask the owner to show you the licenses held by the facility. Choose one that has all the required state licenses that can be the best option for you. Find out all other requirements regarding the ratio of staff members and then make a decision. Location – It is important for you to check the location of the skilled nursing home. The location which you choose should be close to your home so that it could be more convenient for you to visit. Choosing the nearest one can also make it easier to bring your loved one home for holiday visits and other special occasions. We have listings covered from all over Major states in the United States. 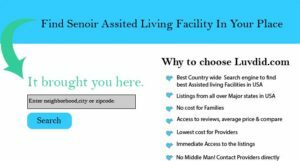 Find assisted living near you & Search for local assisted living communities at LUVDID.Visit: Luvdid.com . If you need any assistance or to get more information contact us at support@luvdid.com . We hope we provided you the best information about how you can choose a right skilled nursing home for yourself. We hope that is all you need to know. I have been browsing online greater than three hours as of late, yet I by no means found any interesting article like yours. It is beautiful price enough for me. Personally, if all web owners and bloggers made good content material as you did, the web will probably be a lot more useful than ever before. to read and incur info. It’s an amazing article in favor of all the families who are in search of Senior living; they will obtain advantage from it I am sure.